Update 22.01.2010: I posted a gallery with full-resolution images. Update 04.05.2014: Fixed images and duplicated text. This page might still be useful to people, so I'm not taking it down, even though the keyboards are not manufactured anymore after FingerWorks was acquired by Apple. Given that I lost all hope of hearing back from FingerWorks support regarding my broken TouchStream keyboard, I decided to take things into my own hands and at least take a look inside. One half of a Fingerworks keyboard, with the top removed. Opening the keyboard isn't very difficult, but requires a lot of care. I did it with two screwdrivers, using one to put pressure on the pegs and another one to gently pry the two case halves apart. I started from the edge away from the connector ribbon and worked from there. The case seems to be glued together around the ribbon connector, approximately 2-3 cm on each side. You can use an exacto knife to cut the glue, and a little extra force seems to be necessary. After opening the case you will see two boards: one of them is the main sensor board, with the touch surface on one side and the sensor chips on the other side. The other one contains some extra circuitry and the ribbon connector socket. 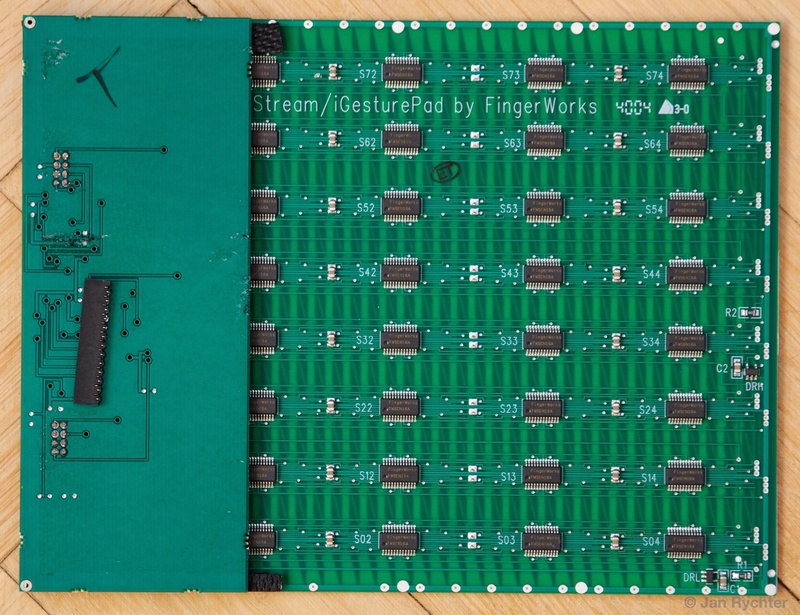 The boards are soldered together using connectors, so you can't easily separate them without using a soldering iron. Inside one of the halves. You can see the FWSEN16A chips. There are 40 chips on the sensor board. They seem to be custom-made for FingerWorks, as each one is marked FingerWorks FWSEN16A. Interestingly enough, a quick search on the Web shows that a number of resellers have them in stock. I found out that even though it is the left half of one of my TouchStreams that is malfunctioning, the defect seems to be in the right half. I swapped in the left half from a keyboard that works, but powers up only once every several tries. The resulting keyboard had exactly the same problem: the upper left quarter was completely dead. Unfortunately, this means that I have two TouchStreams with defective right halves. Not good. ERROR:Run Diagnostics again, keeping surface free of hands and liquids. cause a few false-positive High/Low/Noisy sensor readings below. hardware failure that must be repaired at the factory. 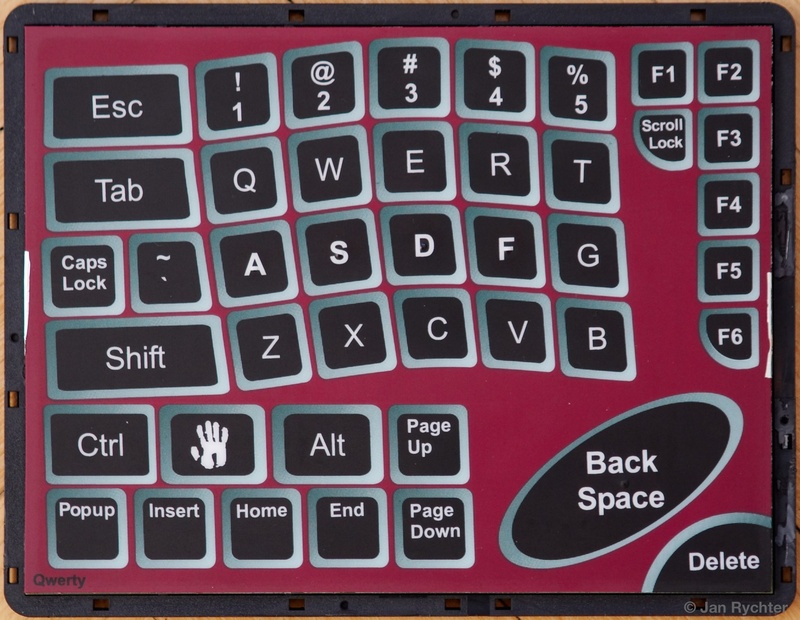 The right half of the keyboard and the daughterboard that contains the processor and the USB interface. UPDATE: I've finally managed to get the right half of my keyboard opened. The boards have been desoldered from one another. One can finally see what is on the CPU board (the board that is connected to the USB cable). 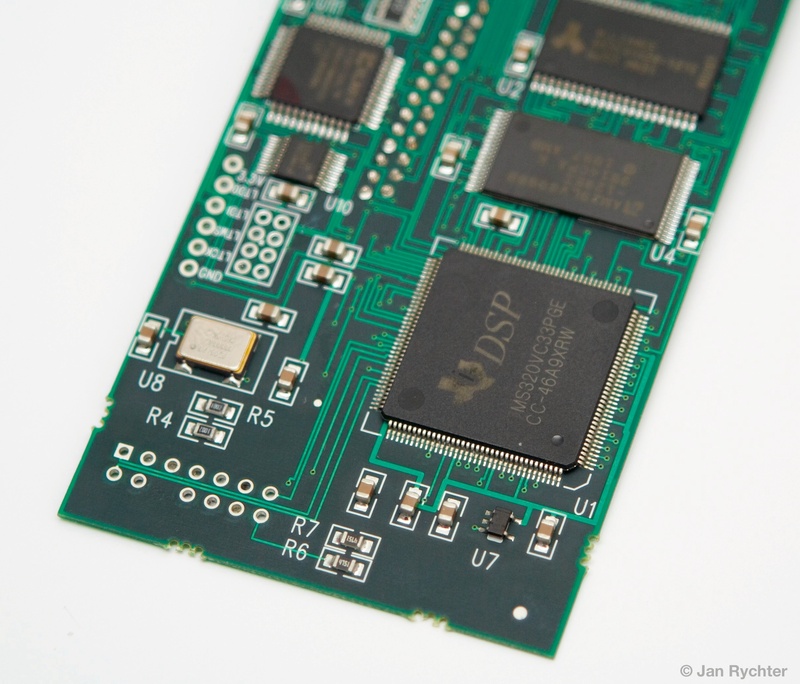 Top to bottom, on the right side of the board you can see: the USB interface chip, RAM, flash, and the TI DSP that is the heart of a FingerWorks TouchStream. On the left side, two Xilinx FPGAs are the most visible. Judging from the way the traces are routed on this board, the bottom FPGA is responsible for the left half of the keyboard. That is also the FPGA that is most likely broken in my keyboard (due to static discharge). The right sensor board isn't much different from the left one, all 40 FWSEN16A chips can be seen. I've removed the sticker on the USB chip, so that the markings on it can be seen. UPDATE: the story ended very well. Thanks to a brilliant co-worker of mine (thank you! ), the keyboard was repaired. It was the FPGA that was blown by the static discharge. Repairing involved reading the contents of an FPGA on a working TouchStream, then programming a replacement and soldering it in. I am the founder of PartsBox, which helps you take control of your electronic parts inventory and project/BOM pricing. Copyright © 2000-2018 Jan Rychter. All rights reserved.